I'll be posting a Bat pattern in the next couple days, the one pictured above. 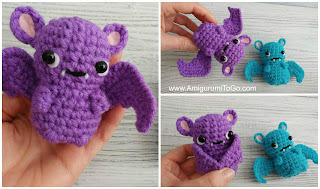 It is among a group of patterns I plan to release this month but never had it done in time for the group photo when I posted the Ghost (pattern posted), pumpkin and Little Frank on my instagram. I've been busy my friends! As soon as I finish one project I'm onto another because this year I promised myself that I would get holiday themed projects done and posted in time for the actual holiday. October is dedicated to Halloween, of course. Today is October 9th and I feel really good about what I've gotten done so far this month. 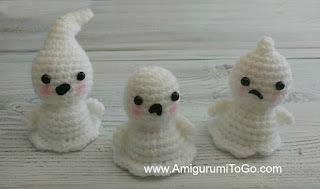 I posted a Pocket Ghost crochet pattern along with a video tutorial. I posted a video tutorial showing how I made a Haunted tree. 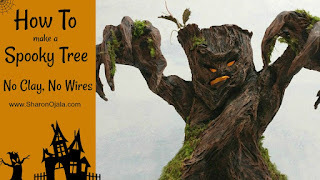 I also have a crafty blog where I'm building a Gnome home among other things. 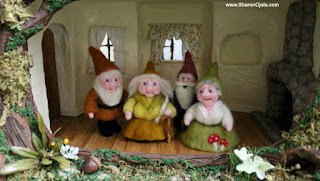 With that blog I have youtube channel called, Where The Gnomes Live. (links below) It's a lot smaller than my crochet channel but I'm slowly building it up! It's about crafting things, mostly miniatures, for a Gnome Home that I've been building for many years. It's home to a few different creatures that I've made as well. Pictured from left to right, Ahti, Aunt Katri, Gnomey and Annie. I needle felted each one. They are Finnish Gnomes that run a Bed & Breakfast. Video tour below. This tour is from last year. I've since moved the home and changed it quite a bit. If you're interested, I'd love to have you join me in my other crafts too. 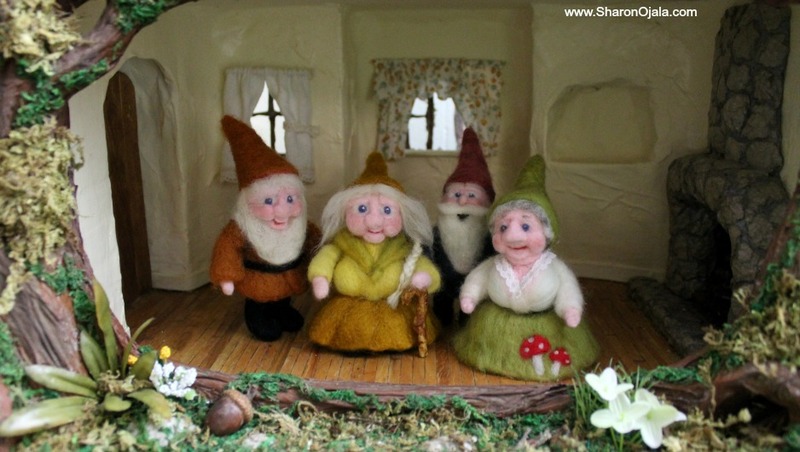 I'm excited to introduce new characters this year and build onto the Gnome home. days on end with no breaks. Sometimes it's nice to put the yarn down and play a little with something completely different. It's a mind breather! 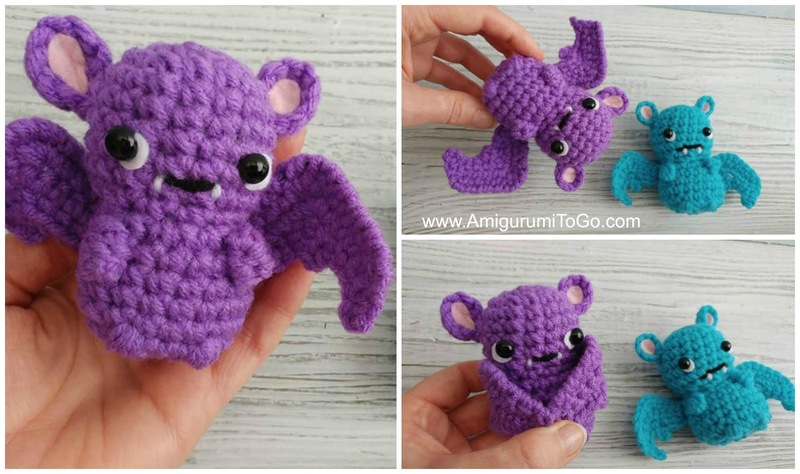 Alright, it's time to get back to work on the crochet Bat pattern. I'll leave you with a story I wrote last year about a Gnome and a baby mouse. Early this morning while the sun was still sleeping, Gnomey went out mushroom hunting. He pulled his sled behind him and enjoyed the quiet. The only sounds he could hear was the sled skis gliding over the snow and a few early birds chirping a cheerful tune. Halfway to the spot he knew mushrooms were still growing he saw something blue, just over in the bushes, something tiny and blue! It's moving! He had to investigate. blue blanket. He was shivering from the cold and was clearly afraid. But the mouse couldn't talk he just let out a "squeak". Gnomey knew he couldn't leave him there. He looked all around for a sign of other mice. He wondered where the mouse's family was, his mother.. father? Oh! He hoped they were okay but he had to take this baby home. He had to get him to a warm place, right now! He put the little mouse on his sled and set off straight for home. He talked to the mouse along the way. He told him all about Aunt Katri and how she would feed him and love him. "She just loves mice! Oh yes little guy, you're going to be warm and full and can stay with us as long as it takes your family to find you." The little mouse was feeling less afraid now. He felt safe with this Gnome. 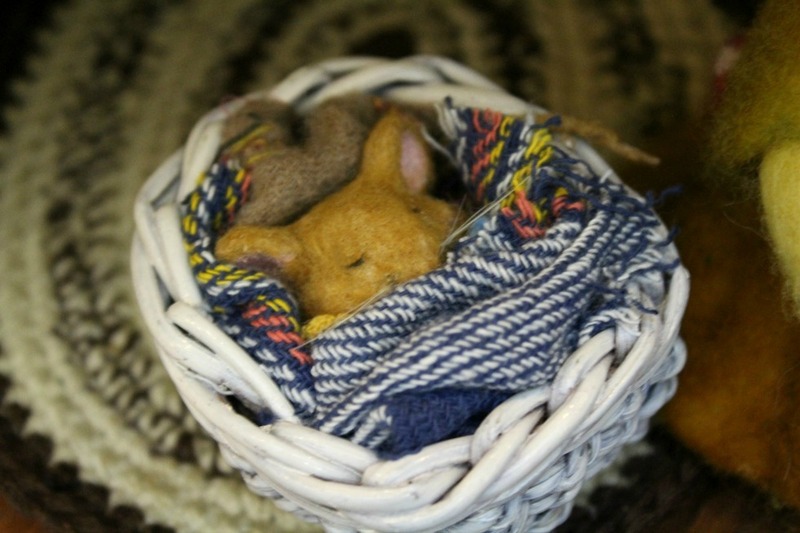 As soon as Gnomey got the little mouse home he heated him some milk while Aunt Katri sat with him by the fire. She couldn't believe this baby was out there in the cold! She felt so thankful that Gnomey was mushroom hunting and found him. "It was meant to be." She said, "You were meant to find him. Send out word tomorrow that we found a baby mouse. We'll keep him here until his family comes for him." They spent the rest of the day keeping the mouse as happy as they could. He ate cheese and drank warm milk until his little belly was full. They read him stories and showed him around the Stump House. work as a cradle. He will sleep in Aunt Katri's room. Shoo Shoo Shoo Sha La La, Put your little cares away. Shoo Shoo Shoo Sha La La, Tomorrow is another day. Shoo Shoo Shoo Sha La La, Close your little eyes of blue! Shoo Shoo Shoo Sha La La, Pretty dreams will come to you.